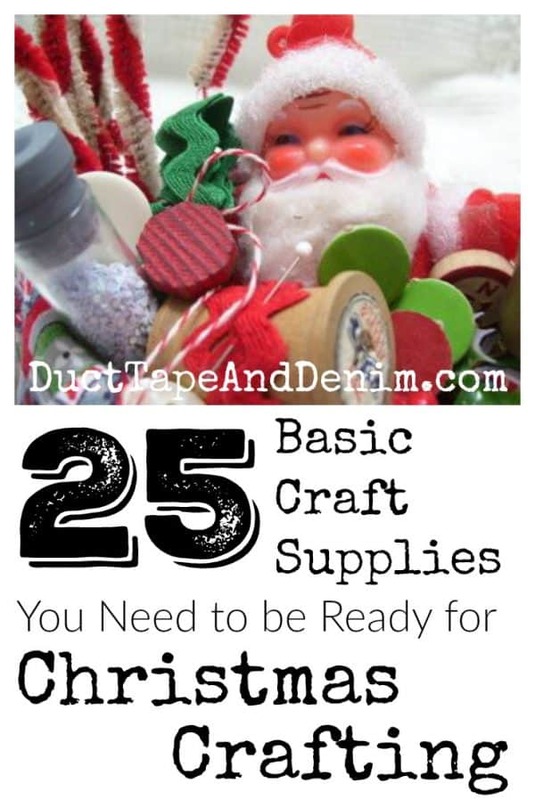 25 Basic Christmas Craft Supplies, Be Ready for Christmas Crafting! 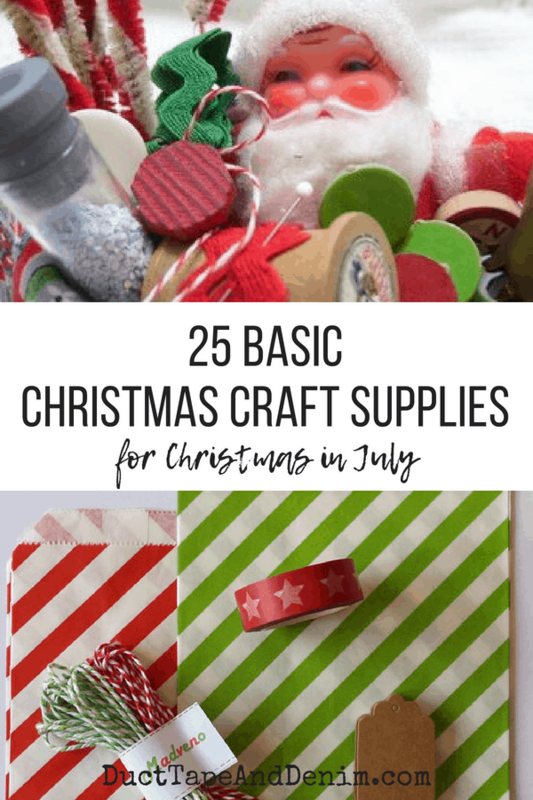 25 Basic Christmas Craft Supplies You Need to Be Ready for Christmas in July! It’s the day after the 4th of July! You know what that means? It’s time to start making Christmas projects!!! Actually, I’ve been making Christmas ornaments for a while now. Last year my Etsy shop got so busy I was making ornaments at the last minute. So this year I’m determined to get ahead. Even if you don’t decorate for Christmas before Thanksgiving, if you’re like me and make most of your decorations and gifts, you’ve got to plan ahead and get started early. That’s why I’m declaring this month “Christmas in July” on my blog and even started a Facebook group JUST for Christmas projects – 12 Days of Christmas Crafts. Come join me for some Christmas crafting, including LOTS of Facebook Live videos!!! Here’s a list of basic Christmas craft supplies that would be useful to gather together. Every year I add a few more to the list so there’s more than 25 now. But don’t worry, you won’t need everything. Most of you are probably experiencing some pretty warm weather right now. So turn up the AC and Christmas music and get crafting! I’ll be sharing LOTS of projects this month. I’ve browsed through what’s coming and if you have these basics you’ll be in good shape! printer paper – I have several project that use just regular printer paper. Plus it’s great for sketching out ideas or practicing your handwriting or testing paint colors. cardstock – Same as printer paper. Plus I have some projects that I print on cardstock and cut out. And if you’re careful you can watercolor on cardstock. Just don’t use too much water. craft glue – Get a basic glue that can be used on many surfaces. In a pinch, you can thin out craft glue with water as use it as a decoupage medium. glue sticks – Glue sticks will be easiest to use with paper. E6000 – I use this for jewelry and most other non-paper projects. glue gun with lots of extra glue sticks – This glue gun is my personal favorite. I love how I can get into tiny spots with it! clear tape – You probably already this tape but I’ll include it on the list anyway. washi tape – Washi tape is so fun that once you get started you’ll have a HUGE collection. You’ll find soooooo many ways to use this! stapler and staples – I’ve found that a basic office stapler works best for me. This is the stapler that I have. spray adhesive – I use this to hold stencils in place. black artist pens, different sizes – My favorites are ultra fine Sharpies and Micron. The Microns come in a lot of sizes. pencil sharpener – I just have this really inexpensive sharpener. rubber stamps – I usually add a new Christmas stamp or set every year so I have quite a collection now! ink pads – Start out with just black. You can do a lot of crafting with just the Christmas craft supplies listed above. I’ll be sharing some projects that just use these basic supplies, too. But if you’ve already passed the “basic” stage. Here are a few more supplies that I use. roll of kraft wrapping paper – This is fun to make your own wrapping paper. decoupage medium – I usually have this around but as I mentioned above you can thin out regular craft glue with water and make your own. Don’t forget to come join us on Facebook — DIY Christmas Crafts. Thanks for reading my post. I hope you’ll join me for Christmas in July! Leave a comment and let me know what kind of things YOU make for Christmas! nfdone Originally published on Jul 5, 2017.We share at these blog parties. Featured on Tumbleweed Contessa. Just joined the group! I love making Christmas ornaments and presents all year long! Our church bazaar is in early November. Was talking about sewing cloth Christmas gift bags in May; friends laughed at me. I promptly told them that I have other things to make myself crazy about in December! Ain’t it the truth! This month I’m crocheting granny squares to sew into cornucopias for grands; candy cane, candy, and a gift card! Joanne’s had fabric last year; had to buy a small piece; circles saying,”I craft so hard, I sweat glitter.” Yep, that’s me! This is a great list! Thanks for sharing on To Grandma’s House We Go! Great list! And if you stagger your purchases with coupons, you could pick up most of this at great discount (instead of buying it all in one cart the week before the holiday). I’ve been crafting all year for Christmas, too – my goal is to have a second tree all decorated in paper ornaments, and to do that, I’ve broken the project down into doing one paper ornament a month. Hopefully all I’ll have left to do in December is to remember to buy a second tree! Now is the time to get a jump on it for sure! Thanks for sharing with SYC.